As stated on the cover, “This book defies the myth that parents must sacrifice themselves. Instead, it shows them how to reclaim their power, balance, happiness … and lives!” Rubin had two addicted children when he wrote the first edition. It’s harsh, but it would have been good for me to read. 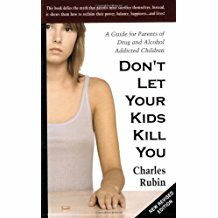 Rubin was depressed and obsessed with his kids and knew he had to change it up. It’s not just his story. It really is ways and means to get a grip and just keep going.